Tips Alert: Turn your old T.V. into SMART T.V. ? 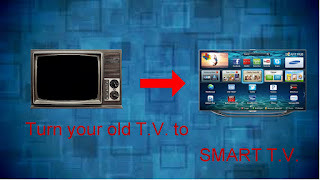 Turn your old T.V. into SMART T.V. ? Instead of buying an expensive smart TV, you can convert your existing set into a web-enabled entertainment centre by just spending a few thousands of rupees. If you're working on a tight budget, you might want to consider an ultra-portable media player. These thumb-sized sticks, which resemble USB pen drives, are capable of streaming content - pictures, music, videos - wirelessly from a PC, smartphone or tablet to your TV screen (provided you have a Wi-Fi router set up at home). Now there are quite a few brands available in the market, but these are either from companies that have almost no presence in the country, or have been tried by only a handful of people. However, Google's Chromecast (Rs 3,999) is available online (unofficially at www.ebay.in, www.amazon.in) and it's also easy to use. Simply plug in the device into the free HDMI port on your television. Chromecast has a microUSB port which needs to be connected to a free USB port on the TV (or an alternative source) to power itself. Then, switch to that HDMI source (using the TV remote) and follow the set up instructions to connect to the existing Wi-Fi network in your home. Now, install the Chromecast app on your mobile device or PC/laptop and connect to the same wireless network. Run the app and follow the instructions to link the device to the adapter. Once the process is complete, you will be able to 'throw' Full HD videos from YouTube onto your television screen (at present, Chromecast comes with video-on-demand channels like Netflix and Hulu that aren't available in India). However, if you have subscribed to local VoD services like BigFlix, BoxTV, Spuul, NexGTv, you can stream their shows to your big screen. For this, you need to install the Google Cast extension in your Chrome browser which will let you send the tab you are currently watching to your TV. Also, there are quite a few free (and premium) mobile apps like EZCast, LocalCast and RealPlayer Cloud that let you stream personal content from your own smartphone and tablet. The Apple TV (Rs 8,295) is a network media player that can be used to stream videos, pictures and music from your iOS or Android device. For the latter, you need to first install an app like Plex, PlayTo or Apple TV AirPlay Media Player on the handset or tablet. While you can subscribe to channels, buy or rent movies on iTunes via this player, you cannot store anything on it. Like the Chromecast, it doesn't include a USB port either, in case you would like to play a movie off a pen drive. While Chromecast is the simplest and the cheapest way to Wi-Fi-enable your television , it does not come with any internal memory or expandable memory slot to store any data. For a complete solution, you can opt for a set-top box media player. All you need is a TV with a free HDMI port and an active internet connection to tap into. Such media players support Full HD content from a variety of sources on the internet. Also, these boxes sport USB ports for your flash drives and external hard disks - and a memory card slot for SD cards, letting you view the content you have stored on them. Additionally, you could opt for boxes with internal storage for your movies and music, especially since these support a wide range of audio-video formats like DVD (VOB files), high-def MT2S videos, Windows Media files and high-quality audio standards like OGG and FLAC. Plus, you get the option to connect to a wired network and the ability to stream content from mobile devices. Open the Google Home app Chromecast cast icon. In the top left corner of the home screen, tap Menu > Cast Screen / audio > Cast Screen / audio. Scroll to find the device card for the Chromecast or TV with Chromecast built-in that is currently casting content.